If in the past 2 or so months you have interacted with the brand of one of the few profitable government companies in Zimbabwe, Powertel, you probably noticed the company has been rebranding. They chose to do it quietly and gradually. Their logo has changed. Corporate colors have changed too. The company also looks to have a new deliberate drive to go after the consumer market with its broadband and voice services. The company’s colors have been changed from blue and red to a lighter blue and yellow. The old logo is from back in the days when the company emerged from it’s parent power company ZESA and had services (backhaul fibre data links) more inclined to enterprise customers looking for branch to branch VPN connections. The new logo has a more consumer feel and is much simpler and rounder. 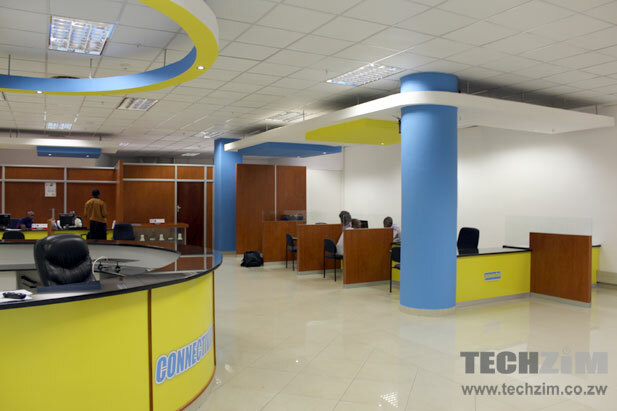 We spent some time at the company’s new HQ at the more modern Joina City in Harare and spoke to the company’s Commercial Director, Willard Nyagwande. 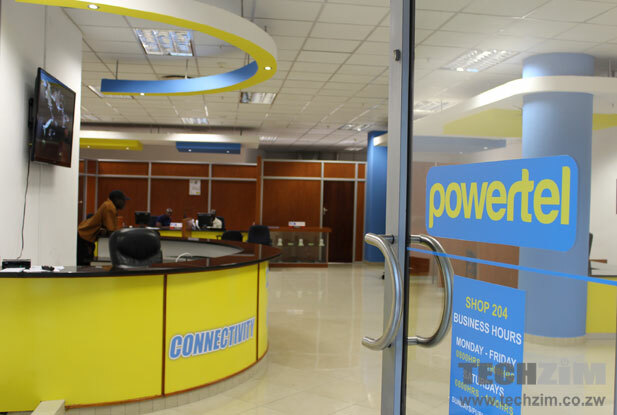 According to Nyagwande, Powertel has now completed interconnection commercial arrangements with other voice providers locally and should finally start offering voice calls to other networks locally in the coming weeks. Along with that will be the introduction of new devices; CDMA mobile phones and Mi-Fi modems. 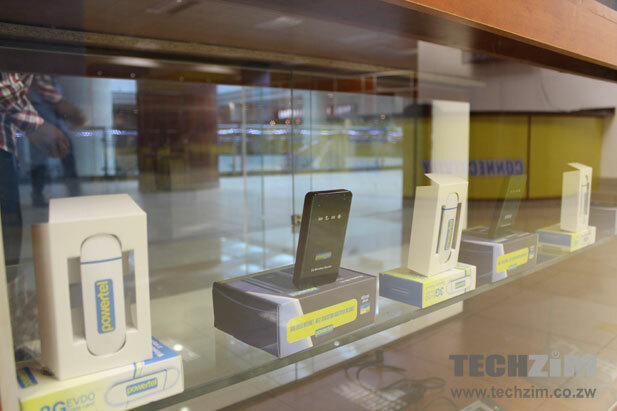 For these new customer devices Powertel has struck deals with local device companies like Astro and GTel but international (well, Asian) sources as well. Nyagwande also told us there will be introducing the new concept consumer service shops around the country in the coming months. They started with the one we pictured below at Joina City. Powertel is also finally introducing its prepaid broadband services, a development that has been outstanding since the company implemented a new billing system last year. More on this later. Eh it’s an improvement, the real test comes with their service delivery. I don’t think a re-brand fixes your problems although it does help you get people to give you another chance, good luck PowerTel! When will Zimbabwean tech realated companies take their own online presence seriously? As policy, we don’t communicate with the companies we cover about when what goes up. purely based on us putting information out there as soon as we can. @kabweza:disqus I can understand that. Unless you exposed their re-branding secret earlier than they would have hoped, there is still no excuse for them to get their online re-branding done ahead of their shops. The fact that their website is done shows that maybe it was possibly just “Forgotten” about. It’s spectacular. Simple, love the colours. Good job in this..something new for a change but I hope its not the same old pathetic service in new colours. Service delivery, quality of Service, Service Delivery Pleeeaase Powertel Pleassse..!!!!! No need to chime in with your default negativity – nothing constructive contributed there. Get the service and let us know or wait to hear from somebody with the facts. Thanks Annabelle but its not default negativity. I bought 3 Africom modems 1 for myself and the others for my young brother and sister. We all echo the same sentiments. so i’ll repeat..quality of Service, Service delivery, Service Delivery.!!!!!!! Your original comment indicated that you don’t know anything about the present quality of service at Powertel which made it a valueless contribution. Now you speak of Africom products which have nothing at all to do with the original topic. Why did you bother? Might it be; Powertel did not make noise about this because from a professional marketing point of view they did not re-brand. What they did is called repackaging. Re-branding involves changing everything from your colors, name, logo and even pay off lines. Making noise over a repackaging initiative would be like Coca-cola spending millions to market a new bottle shape whilst they are still selling the same old Coke. Just a thought. I like! They have a really nice concept. I hope this is an eye opener to their sister government telecoms companies… *cough* *cough*. I can confirm that even after rebranding or repackaging (whichever you choose to call it) their internet speed on fibre is still pathetic comparing to Liquid. Have both links at the office and they are worlds apart. Old wine in new winsekins I guess. Have both Liquid and powertel and right now at 1126pm 1Mbps on Liquid vs 1Mbps on Powertel. Powertel is murdering LTZ Fibre left right and center. Can you start a post on answers.techzim.com and we compare speedtests to france and the united kingdom. you guys yo network is excruciatingly poor, considering ma money i’v paid. i made a payment for three days yesterday and up to now i dont have any network i am so disappointed and angry.What do you call that, when someone pays for something and you dont deliver? is it theft , is it corruption what do you call it ? i am customer in Bulawayo pliz do something coz i’v just thrown away the value of ma wealth to yo betterment.